Coatings of exceptional quality, without any structural defects are possible to produce only by VPS techniques. 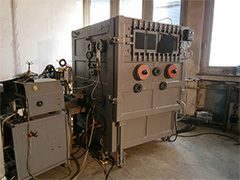 Especially for the purpose of aeronautic industry we developed our vacuum plasma spraying chamber. Maximal working dimensions are 1000mm in diameter and 1200 mm in length. 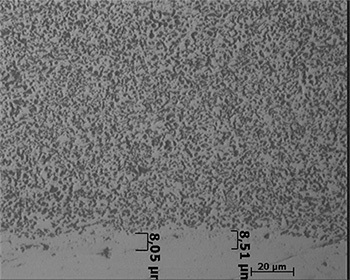 Example of one excellent coatings microstructure are visible on this two photomicrographs for the very important coating material, CoNiCrAlY (Amdry 9954). These coatings have working temperature of 1050 C on air and is used as a material resistant to high temperature oxidation, or like bond coat for ceramic top coat for power plant turbines. Thermally treated at 1080 C/ 4h plus 800 C/ 8h in vacuum. Etched in Kroll reagens. Homogenous dispersion of NiAl phase. Diffusion layer at the side facing the substrate is 8-9 um. 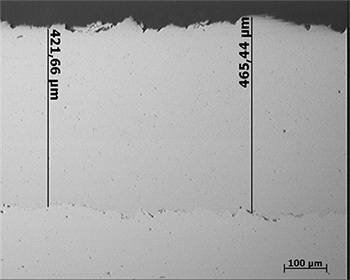 With regard to the microstructural features of a coating (coating is non-porous, oxide-free, with no cracks and delamination, etc. ), this coating exceeds all requirements of the standard Rolls Royce CME 5033.